It was a sunny afternoon in Los Feliz, California when my great-grandfather Avram Yitzhak Lehrer, fondly called “Opi” by his children and grandchildren, sat in his garage smoothing out the figures of his latest sculpture, “L’dor Vador,” meaning from generation to generation. In the sculpture, 19 figures stand with their arms around each other, radiating from a Torah (the Jewish Book of Life). Each figure is a different family member; with Opi and his wife at the head of the sculpture and their children and grandchildren weaving around them. This sculpture captures Opi’s essence–his strength, his generosity of spirit, and his love and commitment to family and Jewish traditions. Opi was born in 1908 in Lanowitz, a small Jewish shtetl in Ukraine. Food was scarce, opportunities limited, and anti-semitism rampant. Life was bleak under the constant threat of pogroms. He and his four siblings lived with their parents in a single room with a dirt floor and crumbling whitewashed walls. When Opi was young, his father escaped from Ukraine to New York City where he worked tirelessly for years as a rag peddler, to save up enough money to pay for the passage of the rest of his family to the United States, to escape the horrors of Lanowitz. Finally, in 1920, a 12-year-old Opi traveled from Lanowitz to Warsaw to Antwerp, Belgium by train and then to the United States by ship, ultimately docking at Ellis Island. When Opi first arrived at Ellis Island, he was asked several questions, including his name and birthday. Conditions were so primitive in Lanowitz that he didn’t even know when he was born! Labor day was given to him as his new birthday. Opi’s first real job in the United States was as a fabric cutter in the garment industry. Opi would resourcefully lay out the patterns in a way that wasted the least amount of fabric. As Opi continued to work in the labor industry, he began to get frustrated at the horrible conditions that laborers were subjected to: long hours, crowded and unhealthy work conditions, and low pay. He started getting involved with radical politics and labor union organizing. He organized workers in sweatshops who were subjected to terrible working conditions. He was almost arrested several times for his work on labor unions. Once, he had to dive out a fire escape to avoid being arrested! In 1938, when he was 30 years old, Opi was blacklisted because of his work on labor unions. Unable to find work, he left for Los Angeles to find a friend he knew who had settled there. Once arriving in Los Angeles, Opi focused his ambitions on real estate and began to learn the business of managing hotels. He soon met another young Jewish immigrant named Gertrude Sinnreich, who would become his wife and my great-grandmother. They married in 1942, and he was drafted to fight in World War II soon after. He was sent to Asia in the CBI (China, Burma, India) theater, and was in the signal corp. He desperately missed Omi and wrote to her every single day he was deployed. After the war, Opi returned to Los Angeles, and started back up with the three successful hotels that he managed. He worked relentlessly: managing buildings, balancing rent dues, and buying new properties. With the of the money that he made from the hotels, Opi turned to what was most important to him: his family. He located every single relative that survived World War II and sent them money. Opi also used his money to support his growing family. Opi had three children who, by the time Opi was in his 60s, would have blossoming families of their own. He bought each of his children houses and set up a trust for his grandkids and future great-grandkids’ (me!) educations. 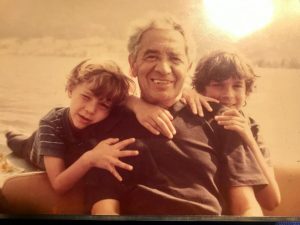 Opi was a true patriarch who supported everyone. 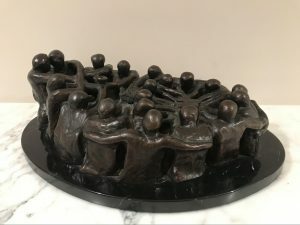 Every Friday night, when my family comes together celebrates Shabbat, the day of rest, I think of the sculpture. We light the candles, say blessings over the food and wine, and remember our family’s roots. I am proud to be a part of Opi’s living legacy. Opi (center) with his grandchildren on vacation in Austria on a boat on the Mondsee. The story of Avram Yitzhak Lehrer was written and recorded by his great-granddaughter, Noa.